Repowering is a common term among electric utilities that refers to rebuilding power plants by taking an old generating unit out of commission, dismantling it, and building a new, modern one at the same plant. The repowered units are more energy efficient, create less emissions, and increase reliability of the power grid. The City of Glendale, Department of Water and Power is proposing to repower the Grayson Power Plant located in an industrial area of the City of Glendale. A majority of the facilities located at the Grayson Power Plant, were completed between 1941 and 1977, and are proposed to be replaced with more reliable, efficient, flexible, and cleaner units. The Project site is located in an industrial area of the City of Glendale at 800 Air Way, Glendale, CA 91201, just northeast of the Interstate 5 and Highway 134 interchange. The site is bounded to the south by the Verdugo Wash and Highway 134, to the west by the Los Angeles River and Interstate 5, to the north by commercial properties and to the east by commercial and residential properties. The site is currently used as the Grayson Power Plant. The Grayson Repowering Project would be located entirely within the existing Grayson Power Plant, an operating power plant. The Grayson Power Plant, named after the City's first Chief Engineer and General Manager Loren Grayson, has been faithfully serving the electrical power needs of the City of Glendale since 1941. Prior to 1937, the City purchased all of its electrical power from the Pacific Light and Power Company (today known as Southern California Edison). That same year after evaluating the current and future electrical needs of the Glendale community, the City not only entered into an agreement to purchase hydroelectric power from the Hoover Dam Project but also made a decision to establish a City owned and operated steam powered electrical generating facility. Construction of the new facility began in 1939 and the first generating unit went into service in 1941. Since that time the facility has been expanded to meet the growing needs of the residents and businesses in the City and has proven to be an invaluable asset to both GWP and more importantly to their customers. However, over time due to age and normal degradation of the equipment, the reliability, efficiency and cost effectiveness of the facility has steadily and continuously declined. Recognizing the tremendous benefit that locally generated power has provided our City and seeing the long term benefits that would be derived from replacing the existing units not only from an efficiency and cost perspective but also an environmental quality standpoint, the City has embarked on a process for the potential replacement/repowering of the existing facility. Keep rates affordable to Glendale ratepayers. Comply with state regulations regarding renewable energy supplies and greenhouse gas emissions. Replace the aged, unreliable, inefficient, high maintenance steam boilers with new efficient and more environmentally responsible generation technologies. Provide a locally controlled source of generation to minimize the City’s reliance on importing power from remote generation locations. Support water conservation efforts by eliminating the use of potable water for generation purposes. The City is proposing to replace all the existing generation facilities and their related infrastructure, with the exception of Unit 9, by removing existing aboveground and belowground equipment, and facilities and building new generation facilities. This includes demolishing the Grayson Power Plant Boiler Building, replacing Cooling Towers 1 through 5, and replacing the generation units, designated as Unit 8A and 8B/C. The existing generation facilities (with the exception of Unit 9) would be replaced with a combination of combined cycle and simple cycle gas turbine generation units. The primary objective of the Project is to replace the aged, inefficient, inflexible, and unreliable generation units at Grayson Power Plant with approximately 260 megawatt (MW) net modern power generation that is efficient, reliable, operationally flexible, and that can easily integrate into the City of Glendale’s power system. This Project would ensure system reliability, balance renewable imports, and meet the power needs of the City in the event that the importing capacity from external transmission lines is not available to serve its load. The City of Glendale, Department of Water and Power (City) is proposing to repower the Grayson Power Plant (Project), located in an industrial area of the City of Glendale at 800 Air Way, Glendale, California 91201, just northeast of the Interstate 5 and Highway 134 interchange. A majority of the facilities located at the Grayson Power Plant, with the exception of Unit 9 (a simple cycle peaking plant built in 2003), were completed between 1941 and 1977, and are proposed to be replaced with more reliable, efficient, flexible, and cleaner units and related facilities and infrastructure. The City is proposing to replace all the existing generation facilities, units, and their related infrastructure, with the exception of Unit 9, by removing existing aboveground and belowground equipment, and facilities and building new generation facilities. This includes demolishing the Grayson Power Plant Boiler Building, replacing Cooling Towers 1 through 5, and replacing the generation units, designated as Unit 8A and 8B/C. The existing generation facilities (with the exception of Unit 9) would be replaced with a combination of combined cycle and simple cycle gas turbine generation units. The Project would be located entirely within the existing Grayson Power Plant, an operating power plant. 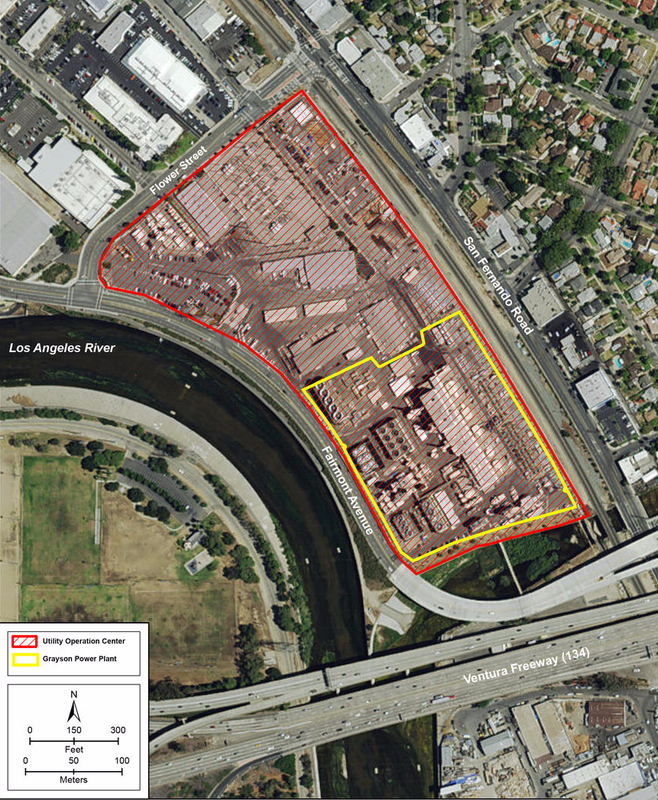 The site is bounded to the south by the Verdugo Wash and Highway 134, to the west by the Los Angeles River and Interstate 5, to the north by commercial properties, and to the east by commercial and residential properties. 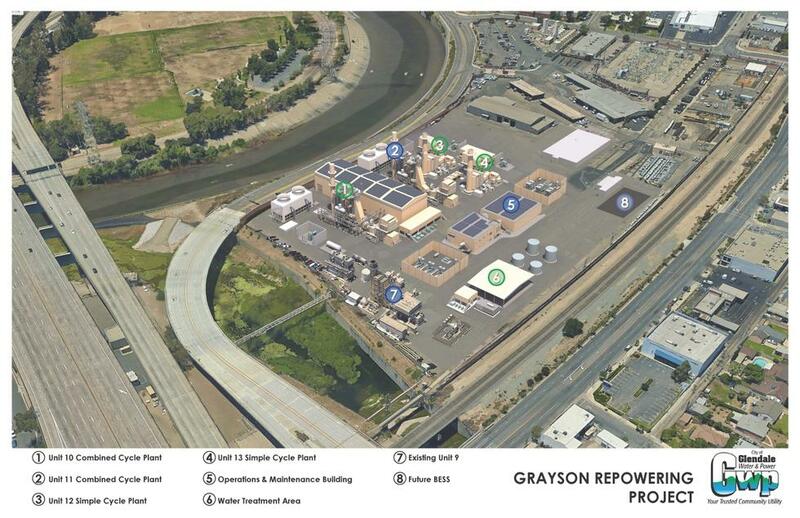 The approximate coordinates of the Project are 34° 09’ 19” N and 118° 16’ 42” W.
The proposed repowering of the Grayson Power Plant is necessary to meet current and future City energy needs and California Renewables Portfolio Standard (RPS) requirements. Pursuant with Senate Bill 350 that was signed into legislation in October 2015, the RPS requires retail sellers and publicly owned utilities including GWP to procure 50 percent of their electricity from eligible renewable energy resources by 2030. The City serves its power system load through a combination of renewable energy sources (both local and imports), non-renewable imports, and local generation. The City system’s single largest contingency is nominally 100 megawatts (MW) based on imported power through the maximum City allocation on the 500 kilovolt (kV) Pacific Direct Current (DC) Intertie (Path 65). In order to meet retail power load obligations, Glendale Water and Power (GWP) relies on a combination of both local and remote generation, as well as long-term power purchase agreements and spot market purchases from a variety of suppliers throughout the Western Electricity Coordination Council (WECC) territory, including the California Independent System Operator (CAISO). Natural gas for generation is supplied by several sources, which include gas reserves in Wyoming, a pre-paid gas commodity contract, and the daily gas market. Landfill gas for generation at Grayson is supplied via dedicated pipeline from the Scholl Canyon Landfill in the City of Glendale. GWP also uses transmission and generation rights to take advantage of arbitrage opportunities and to transact with counterparties in the wholesale market. As a result of recent state mandates, GWP is becoming more involved in short and long-term markets for renewable energy and carbon allowances. GWP operates within the Balancing Area of the Los Angeles Department of Water and Power. In June 2015, GWP completed its Integrated Resource Plan (IRP) that identified 262 megawatts (MW) of local generation at the existing Grayson Power Plant site as the best option to meet regulatory requirements for reliability. GWP has proposed to repower the exisiting Grayson Power Plant on the existing plant Site. The Project would replace 238 MW of the existing capacity from the boiler units (Unit Nos. 3, 4, 5) and combined cycle units (Unit Nos. 1, 2, 8A and 8B/C) with more efficient generation. Unit No. 9 commissioned in 2003, would remain. The project would comprise two 50 MW simple cycle units and two 75 MW one-on-one combined cycle units. Unit size is limited so that minimum generation levels would closely match the City's internal generation needs under low system load conditions.The simple and combined cycle unit sizes are also strongly influenced by the City's intent to self-supply spinning and non-spinning reserve and to integrate future renewable resources to meet state regulatory requirements for increasing procurement of renewable energy resources. Landfill gas is considered a renewable energy resource. Currently this landfill gas is located at an existing Class III nonhazardous landfill that has been accepting waste since the 1960’s. This waste is naturally decomposing and producing landfill gas that includes methane, a greenhouse gas that is combustible and can be put to beneficial use. This will help the City of Glendale achieve the State of California mandate that every utility shall provide a certain portion of renewable energy to their electric generation portfolio. By converting landfill gas to renewable energy the City can receive 100% renewable credit for the energy produced. Currently, the City is blending the methane gas with natural gas to produce electricity at the existing Grayson Power Plant boilers. The City is only receiving 50% credit for the renewable energy produced because the landfill gas is blended with natural gas, which is not a renewable resource. The City will produce and receive 100% renewable credit by installing generation units that can directly burn the landfill gas at the project site. Combusting and producing electricity at the landfill site will enable the City of Glendale to decommission the approximately five-mile pipeline between the landfill site and the Grayson Power Plant. Currently, the landfill gas is collected at a central location within the project site where it is compressed, liquids are removed, and the landfill gas is piped to the Grayson Power Plant via an underground dedicated pipeline approximately five-miles in length where it is blended with natural gas then used as fuel in the boilers to make steam to generate electricity for the City of Glendale. The Grayson Power Plant is being repowered and the new turbines cannot use the landfill gas as fuel. The landfill gas is constantly being produced at the landfill and there are only two options currently available: burn it in the air by flares or put the landfill gas to beneficial use by using it as fuel for the generation of renewable electricity. For more information on the Proposed Biogas Renewable Generation Project click here. Are you expanding the Grayson Power Plant? No, Glendale Water & Power (GWP) is not going to expand the Grayson Power Plant. The driving force for replacing the obsolete Units 1-5 and 8* at the Grayson Power Plant is to ensure a reliable electric supply for the citizens and residents of the City of Glendale. A majority of the facilities located at the Grayson Power Plant were completed between 1941 and 1977, and must be replaced. We are proposing to rebuild substantial portions of the plant by taking old generating units out of commission, dismantling them, and building new, modern units in their place. This process is called repowering. The new repowered units will be cleaner, more energy efficient, and will greatly increase the reliability of Glendale’s power grid. * units 6 and 7 were retired several years ago and dismantled. Unit 9 is about 15 years old and will continue to operate. How is GWP going to pay for the repowering of the Grayson Power Plant? GWP is proposing to finance the repowering project which has an estimated cost of $500 million, through the issuance of revenue bonds. GWP sells bonds to finance capital projects, and the payments for the GWP bonds are covered by the revenue that GWP receives from its customers based on its rate schedule. The tax revenues that the City receives are not used to pay off GWP bonds. The final cost will not be determined until the detailed design is finalized. transmission costs. Additionally, the new units will be able to provide reserves (on-line generation that can respond to losses in supply) more cheaply than purchasing and importing reserve capacity from other sources. These savings will pay for the bonds. What if the City does not repower the Grayson Power Plant? Units (1, 2, 3, 4, 5, and 8) are all 40 to 70 years old, are not expected to continue running much longer and maintenance on these units is temporary and very costly. In addition, forthcoming air quality regulations will require GWP to do expensive retrofits, or shut down the plant within the next few years. If GWP does not repower the Grayson Power Plant, our sources of supply will be limited to purchased power, which is not always guaranteed and is very costly with extreme increases in costs for spot market purchases. Is GWP repowering Grayson to generate excess power in order to sell it for profit? No, the proposed repower is to meet the City’s energy needs and to ensure that there is a reliable source of power for Glendale. GWP is not repowering to sell energy for a profit. The capacity of the Grayson repower was driven solely by the reliability needs of Glendale and minimizing rate impacts to GWP customers. Glendale doesn’t need this much power. Why are you building such a large plant? Do we really need this much? The capacity of the Grayson Repowering Project is driven to reliably serve the needs of the residents and businesses of Glendale. Without the Grayson repowering and after Units 1-8 are no longer capable of running, the available capacity through imports from outside sources and the one newer unit at Grayson Power Plant—Unit 9—is 287 MW. GWP must have in place sufficient reserve sources of power to cover both the “loss of the single largest contingency,” which is referred to as its “N minus 1” or “N-1” “contingency” and its second largest contingency, which is referred to as its “N minus 1, minus 1” or “N-1-1” “contingency” and involves two contingencies – the loss of Glendale’s two largest resources -- happening consecutively. This means that we must maintain enough generating capacity to power the City even if there is an unexpected failure or loss of our largest two sources of power. For GWP, the largest single source of power is the DC Intertie line, which transmits 100 MW of power to the City. See image of GWP’s sources of power here. 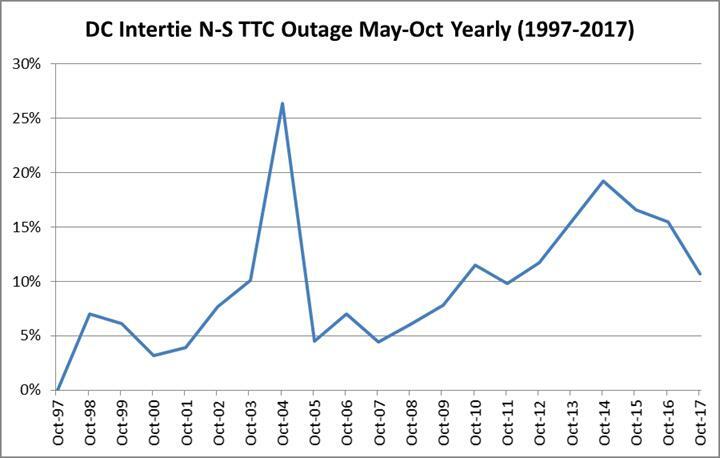 In fact, partial and complete loss of the DC Intertie line has occurred in the past, and some of the outages have been for extended periods of time. In addition, reserves must also be in place to re-establish reserves within one hour. With the loss of GWP’s single largest contingency, the City would have only 187 MW of supply available for meeting its obligations. GWP’s next single largest contingency (N-1-1), after loss of the DC Intertie line, is assumed for planning purposes to be 71 MW, the loss of a unit at the power plant. If an N-1 event (the 100 MW loss of the Pacific DC Intertie) occurs, Glendale must plan and prepare for the loss of a 71 MW unit at the power plant (i.e., GWP’s N-1-1 contingency). This requires GWP to have 71 MW of replacement energy available within 10 minutes of the loss of the 71 MW generator. In this scenario, GWP has lost 100 MW of import capability on the Pacific DC Intertie and has subsequently lost 71 MW of local generation (before the 100 MW on the Pacific DC Intertie was restored). Therefore, Glendale must replace 171 MW of “lost” energy supply on a potentially on-going basis (i.e., longer than one hour). With the loss of GWP’s two largest single contingencies, the City would have only 116 MW of supply available for meeting its obligations. GWP’s system load exceeds 187 MW more than 80 days a year and exceeds 116 MW daily. With respect to a peak day, GWP’s peak load is 350 MW (with no allowance for reserve margin) and there would be a shortfall of 163 MW associated with GWP’s N-1 contingency and a 234 MW shortfall if GWP had N-1 and N-1-1 contingencies. Such shortfalls would have to be supplied by resources internal to the City. The Grayson Power Plant, once repowered, would add a capacity of 262 MW at average annual conditions (64° F). On a hot day (95° F), that capacity would fall to 242 MW. On the peak load day (100°+ F), the available additional capacity would be slightly less. With 242 MW available at Grayson Power Plant, the City would be able to cover both its N-1 and N-1-1 contingencies. Thus, the Grayson Repower allows GWP to reliably serve Glendale by providing sufficient capacity to cover the loss of GWP’s two single largest contingencies and still meet load, as well as the non-operating reserve that could be started to provide the required spinning reserve. Additionally, as GWP imports increasing amounts of wind, solar and other variable sources of renewable energy into the City, and as more solar power is generated locally in Glendale, this creates increased fluctuations on the power grid. A steady, constant source of energy such as that from the Grayson Power Plant is needed to balance out (“firm and shape”) the energy so that that a smooth and steady supply of power can be delivered to GWP customers. The old units at the Grayson Power Plant do not have the ability to rapidly adjust up and down to account for variances in solar output, based upon weather patterns on a minute-per-minute basis. Modernizing Grayson will allow us to manage renewable energy flows dynamically, so that energy deliveries will continue to be reliable. Will GWP install any renewable energy sources at Grayson? Yes, GWP will be placing solar panels onto the new buildings at the Grayson Power Plant, totaling approximately a ½ MW. GWP also plans to install 40 MW/80 Megawatt-hours (MWh)*** of short-term battery energy storage for regulation purposes at Grayson to reduce short-term cycling of the units. This will be done after the power plant is repowered. GWP is a leader within California in supplying renewable and carbon-free electricity. In 2016 GWP sourced 64% of the energy it supplied to Glendale from carbon-free sources (compared to 44% for all of California). Glendale is already close to meeting the requirement for 2030 that publicly-owned utilities procure 50 percent of their electricity from eligible renewable energy resources. Today, far ahead of the 2030 target date, Glendale procures 47 percent of its electricity from eligible renewable energy resources. GWP is committed to renewable energy and continues to expand our programs to use more solar and wind power. *** A megawatt hour (MWh) equals 1,000 kilowatts of electricity used for one hour. Will potable water be used as part of the repowered Grayson Plant? The Grayson Power Plant would use recycled water for all process and cooling water requirements. The main use for recycled water includes boiler water makeup, cooling tower makeup, turbine power enhancement and cleaning, and NOx control for the simple cycle units. Recycled water would also be used for Unit 9 in place of potable water currently being used. The use of recycled water would eliminate the need for 20 acre-feet of ground water from wells in Glendale and 41 acre-feet of potable water currently being used, which is also water efficient and helps improve the City’s overall water conservation efforts. California’s cap and trade program requires all power producers to pay a cost per ton of CO2 emitted. Is the cost being underestimated? The cost of greenhouse gas credits would be incurred by Glendale whenever they use electricity from fossil fuel resources, whether GWP generates it or it is imported over the transmission system. Fossil fuel resources will be required until systems of energy storage have been proven on a utility scale for a utility such as GWP. The operating costs would therefore be incurred either way. Intermittent renewable purchase contracts also include a portion of fossil fuel generation. 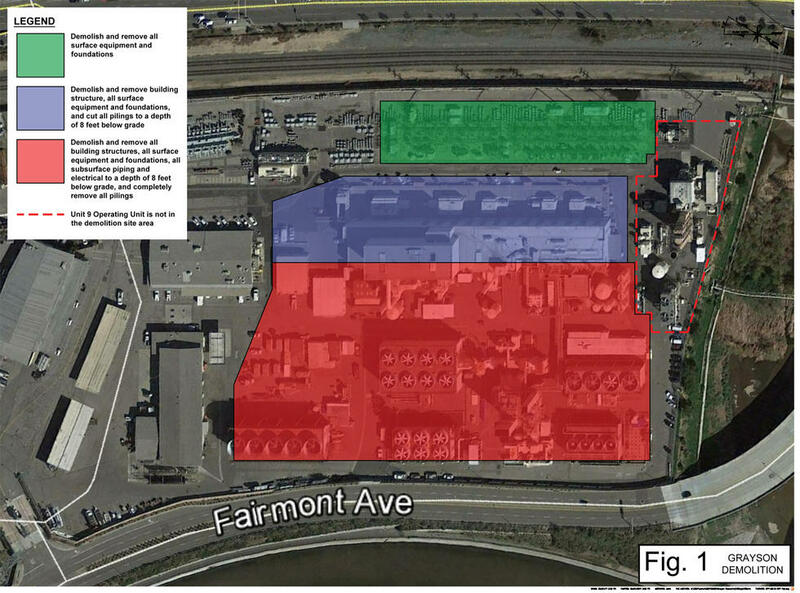 Does the Grayson Power Plant sit on a mapped Liquefaction Hazard Zone? Like much of the Glendale area, the Grayson Power Plant site is located within a liquefaction hazard zone. A site-specific geotechnical study for the repowering project was performed and included analysis of both seismic and liquefaction risks. The geotechnical study included recommendations for project design in conformance with applicable building codes, which include considerations for seismic and site-specific liquefaction hazards. The site has been the home to the City’s local generation for over 75 years and has been subjected to several major earthquakes, including the Sylmar and Northridge earthquakes. Notably, GWP has been able to restore electricity to its customers faster than any other nearby city or Southern California Edison, in part due to having local units at Grayson that were either already operating or were started up, due to seismically-induced loss of transmission imports. Why can’t GWP just have solar panels and batteries to power Glendale? GWP has reviewed the feasibility of solar PV with battery storage before and also considered solar PV with battery storage as a project alternative. GWP found that such a system is not feasible because of physical constraints. Glendale does not own or control sufficient real estate to develop a utility-scale solar with sufficient capacity coupled with energy storage to reliably serve Glendale’s power needs. Obtaining the required capacity through rooftop solar would be significantly more costly than the proposed repowering project and the pace of rooftop solar development is not rapid enough to replace the need for the Project. Additionally, GWP does not control private rooftops within Glendale. For these reasons solar with battery storage was not considered a feasible alternative to meet Glendale’s current needs. However, we continue to pursue other renewable energy options, including solar power and battery storage as part of the integrated plan to meet the city’s energy needs. Through the efforts of private individuals, businesses and GWP, almost 15 MW of rooftop solar PV capacity has been developed within Glendale over the past 10 years and GWP has installed a 2 MW battery energy storage system at its Grandview Substation. Can Scholl Canyon be used as a solar site? GWP partnered with a private developer two years ago to study the possibility of developing a solar project at Scholl Canyon. The developer determined that the site constraints at Scholl Canyon made it unsuitable for solar development. For example, the existing environmental control systems for the landfill are required even for a closed landfill (these systems gather methane gas that would otherwise escape to the environment, a gas that has a global warming potential 21 times greater than CO2). Those systems require continued access, which consequently limits the land available for solar panels. In addition, the landfill is subject to significant settlement, which would take the solar panels out of alignment, as well as complicating the electrical gathering system design, necessitating regular rebuilding and realignment. Will the repowered plant increase air pollution in the area? The permitted emissions from the Grayson Repower project will be less than the permitted emissions from the existing Grayson Power Plant. GWP developed emissions estimates for the Grayson Repower to use as a basis for permitting. The permitting process is based in part on the worst case daily emission and peak season monthly emissions coupled with the need to provide sufficient starts and operating hours for possible contingencies. Even with these conservative estimates, the permitted emissions from the repowered plant would be less than the permitted emissions from the existing plant. Demolition of the existing facility and soil remediation will take 9 months. How are you making sure no contaminants if any are emitted into the air? During demolition of the existing facility, waste removal plans will be developed and implemented to ensure that no lead or asbestos or other known contaminants are emitted into the atmosphere. Demolition will be done in accordance with applicable federal, state and local requirements. These requirements address containment and handling of materials, as well as a monitoring plan to ensure compliance. These requirements are not specific to the demolition of a power plant; they apply to all demolition work. The contractors we will use are licensed to do this type of demolition and meet these requirements. While the RFP identifies a need of 235MW of capacity, Glendale doesn't need anything close to 235MW of capacity. This is incorrect. The RFP identifies a need of 235MW, because Glendale needs 235 MW of capacity. To be exact, the Clean Energy RFP seeks 234 MW of capacity in order to ensure that Glendale can meet peak load and cover its contingency reserve obligation (N-1-1). The Clean Energy RFP makes clear that Glendale will consider multiple projects to reach the 234 MW need, and the minimum size project that can be proposed is 1.0 MW. Also, the 234 MW capacity figure does not take into account current load growth projections due to electrical vehicle usage. Analysis from the Department of Energy's National Renewable Energy Laboratory (NREL) shows that electrical vehicle usage could drive a significant increase in load over the next three decades. See here. Glendale's need of 234 MW of capacity is shown in Figure 1 below. Glendale needs an additional 63 MW of capacity to meet peak load.1 In addition, Glendale must maintain sufficient reserves to cover the loss of its single largest contingency (N-1) and its second largest contingency (N-1-1). Glendale's current single largest contingency (N-1) is the loss of its share of the Pacific DC Intertie transmission line, which equates to the loss of 100 MWs generation. If glendale repowers the Grayson Power Plant, its second largest single contingency will be loss of one of Grayson's 71 MW units. Together, Glendale's N-1 and N-1-1 equate to a total of 171 MWs. When this is combined with the 63 MW needed to meet peak load it equates to 234 MWs. 1 The capacity numbers shown in Figure 1 reflect "best case scenario" capacities. During high heat conditions, the capacity is often lower. Of the 234 MW, 65 MW is to meet peak load and the balance, about 170 MW, is for Planning Reserves. This is inaccurate. The 234 MW figure has three components, not two components. The first is the 63 MW needed to meet peak load. The second is the 100 MW of contingency reserves needed to cover Glendale’s N-1 condition. The third component is the 71 MW of planning reserves used to cover Glendale’s N-1-1 condition. There is no FERC or NERC requirement to maintain N-1-1 levels. As GWP has stated, Glendale does not have a direct obligation under the NERC Reliability Standards to maintain reserves. LADWP has that direct obligation. However, to the extent that the commenter is stating that there is no reliability requirement to maintain N-1-1 reserves, this is incorrect and reflects a basic misunderstanding about energy reserves, energy reserve planning and Good Utility Practice. First, FERC and NERC do not promulgate separate reliability standards; FERC is the regulatory body that approves the NERC standards. So there would not, in any event, be separate FERC and NERC standards on reliability. There are regional standards, however, including in the WECC region in which Glendale is located. When it comes to reserves, the regional WECC standard for Balancing Authorities is more stringent than the national, NERC standard. NERC Reliability Standard BAL002-WECC-2a part M1 is the regional standard in WECC (the region in which Glendale is located). It requires the Balancing Authority to maintain more stringent minimum reserves and requires restoration of contingency reserves (N-1) within 60 minutes following an event, rather than within the longer, 90 minute period in the national standard BAL-002. If the N-1 is not restored within 60 minutes, then the utility must have the reserves needed to cover its next largest contingency (the N-1-1), in order to comply with BAL-002-WECC-2a part M1. Put another way, if the contingency event lasts longer than 60 minutes, then the N-1-1 contingency becomes the new, single largest contingency, and it has to be covered. Extreme event resulting in two or more multiple elements removed or cascading out of service. In the context of the TPL standards, an entity meeting its N-1-1 contingency is referred to as meeting its Planning Reserve obligations. Planning Reserves (N-1-1 coverage) are separate and distinct from Contingency Reserves (N-1 coverage). Each set of reserves must be met separately. There is no obligation under the Balancing Authority Area Services Agreement (BAASA) with DWP to maintain N-1-1 reserve levels. Glendale operates, and has operated for decades, as a metered subsystem within the LADWP Balancing Authority Area (BAA). A metered subsystem is a geographically continuous system located within a Balancing Authority (usually a load serving entity) “which is responsible for balancing its own load and resources within its territory.”2 In this role, Glendale has maintained reserves pursuant to its transmission service and related contracts, which contemplate it providing said reserves and operating pursuant to “Good Utility Practice.” These contracts predate the NERC Reliability Standards from the Energy Policy Act of 2005, by many decades. As such, Glendale has for decades maintained (by self-supply or purchase) reserves to cover both an N-1 and N-1-1 event. Because Glendale has agreed to meet these obligations, if Glendale were to fail to do so, it could risk legal exposure for damages, contract penalties and pass through of any NERC penalties. In addition, WECC would impose mitigation measures to prevent a future outage. These mitigation measures would require that the necessary amount of reserves are maintained, which would result in Glendale being responsible for self-supplying or purchasing these reserves. 2 153 FERC ¶61,024 at P 8 (2015). The decision to maintain enough reserves to meet the N-1-1 condition (170MW of reserves) is solely a policy decision. It should be decided on a prudential basis. Any discussion of external obligations is misleading. Glendale is obligated under the terms of its long-standing agreements to maintain reserves and operate and maintain its system in conformance with Good Utility Practice. LADWP, the CAISO, other Balancing Authorities in California, the New York ISO, the ISO-North East, and virtually every other BA, ISO and RTO maintain reserves necessary to meet both the N-1 and N-1-1 contingencies and avoid outages. The utilities’ practice of maintaining reserves to meet N-1 and N-1-1 contingencies predates the NERC Reliability Standards, which were born out of the Energy Policy Act of 2005. Utilities maintain reserves to cover N-1 and N-1-1 because Good Utility Practice requires that a system operator be able to handle more than just the loss of one contingency. This is especially prudent for a utility like Glendale which has transmission constraints and cannot meet its load and reserve obligations using solely outside resources. Glendale is required to have no more reserves that what the BAASA requires, which is 80MW. The City has three options of obtaining that 80MW of reserves: (1) Glendale can self-supply, (2) It can purchase from a third party, which will be difficult given transmission challenges, or (3) it can “get them” from LADWP. LADWP is obligated to provide 80 MW reserves under the BAASA. This is wrong. Glendale must maintain reserves for both the N-1 and the N-1-1 scenarios. The BAASA only provides Glendale 80 MW of N-1 reserves for 60 minutes. The BAASA does not provide Glendale any N-1-1 reserves. Glendale only has the 80 MW of reserves to cover its N-1 contingency for one hour. At the end of the hour, if the Pacific DC intertie line is not back in service, Glendale is essentially on its own as LADWP will only continue to supply Glendale the 80 MW of energy after the hour if LADWP has excess generation available to do so. The rate for this energy is three times LADWP’s Tariff energy rate and GWP must return the energy it purchases back to LADWP at a future time. If the contingency lasts more than one hour, Glendale must also cover its second largest contingency (the N-1-1 contingency), because this is now becomes Glendale’s N-1 contingency. Because GWP’s N-1 contingency is the Pacific DC Intertie Line, which experiences frequent outages and de-rates, GWP is often in this position. Under the BAASA, Glendale has purchased 80 MW of N-1 reserves from LADWP, for up to a 60 minute period. The BAASA allows Glendale to self-supply these reserves, but in order to do so, we would need to have reliable generation available to supply the reserves. The BAASA allows us to buy these reserves from someone else, but as the commenter notes, this is not a feasible option with our transmission constraints. Or we can buy it from LADWP. However, the purchases above the 80 MW have the limitations noted above and require transmission which may not be available. The BAASA does not provide N-1-1 reserves to Glendale. In addition, buying reserves from LADWP is not cheap, and the ancillary service prices in the BAASA are not fixed. BAASA costs are based upon LADWP’s Tariff energy rates. The BAASA rates have increased significantly since the BAASA was signed and are certain to increase in the future. The commenter assumes that BAASA cost increases are limited to instances where “they [LADWP] have to build new capacity to support us.” This is not the case. LADWP has announced that it will enter the CAISO Energy Imbalance Market in the year or two, at which time the reserve capacity that LADWP current has set aside for Glendale will become much more valuable, and LADWP will have less and less capacity available for Glendale. In addition, the BAASA can be unilaterally canceled by LADWP at any time, on 18 months’ notice. Therefore, even assuming the BAASA fully covered Glendale’s reserve needs – and it does not –it is not a prudent strategy to rely exclusively on LADWP and the BAASA contract. 3 Plus 6 MW of transmission losses. LADWP would have to build new capacity to support us. This is inaccurate. LADWP and Glendale do their own separate and distinct Integrated Resource Plans, which only address their individual needs. LADWP does not and cannot be expected to meet Glendale’s generation requirements as LADWP can only serve loads in its service territory. If Glendale has 80 MW of reserves and an N-1-1 event occurs, LADWP will be obligated to cover us. This is false. LADWP has no obligation to cover Glendale’s N-1-1 scenario. Additionally, LADWP will only supply Glendale energy to cover an N-1 scenario after 60 minutes, if LADWP has the energy available. If an N-1-1 event takes place, this means that Glendale is in a situation where it has lost its two largest energy resources: (1) the Pacific DC Intertie Line has gone down (the N-1 contingency) and (2) Glendale has lost a unit at the power plant (the N-1-1 contingency). If this were to occur, for the first 60 minutes, LADWP would provide Glendale with 80 MW of energy to cover the N-1 contingency (loss of the Pacific DC Intertie), under the BAASA. The BAASA does not contemplate LADWP covering Glendale for the N-1-1 contingency (loss of the 71 MW unit). This means that Glendale would be 71 MW short. At the end of the 60 minute period, if the resources are not restored, Glendale would have a shortage of 151 MW (80 MW of lost import capability on the Pacific DC Intertie Line, and 71 MW loss of generation from the unit). Glendale would be required to scramble to find generation to cover this 151 MW loss. Due to transmission constraints, it is likely that it would not be able to cover even part, let alone all, of this loss. This would result in rolling blackouts to Glendale customers. This concern about not being able to find sufficient generation is exacerbated by the fact that LADWP has a large ownership share of the Pacific DC Intertie line. Therefore, if the N-1 contingency occurs (i.e., the Pacific DC Intertie line goes down), the capacity shortage will also affect LADWP. 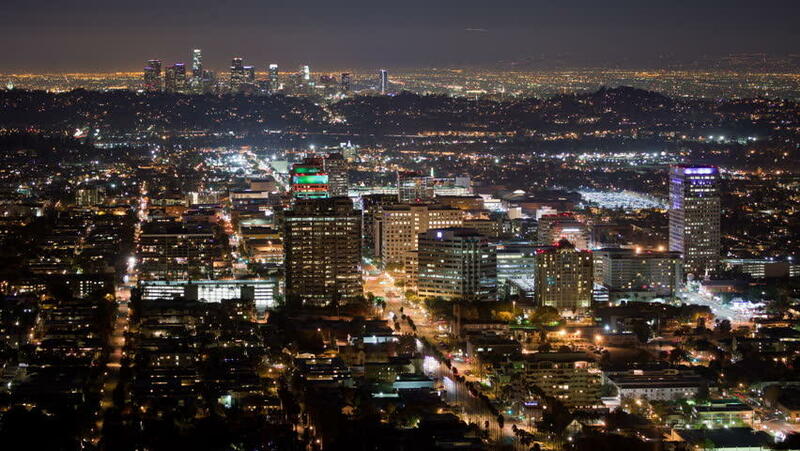 With the loss of the Pacific DC Intertie, LADWP will be scrambling to meet the needs of its own residents and may not have excess energy available to sell or the excess transmission capacity available to deliver the energy to Glendale. Also, if an N-1 occurs during one of the peak load months, the entire region will be short of generation, which will make it difficult for Glendale to purchase energy from third-parties. This is why “Good Utility Practice” dictates that Glendale have sufficient local generation reserves to respond to these situations. Having blackouts is not a planning solution and cannot be a part of Glendale’s Integrate Resource Plan. LADWP cannot force us into rolling blackouts unless they themselves are implementing blackouts in their own service territory. False. LADWP has no obligation to prevent us from entering into rolling blackouts and no obligation to provide us with energy and capacity. The BAASA provides that, in the event of an emergency, a party must render all available emergency assistance to the other party as requested. However, if there is no generation available or if there is no transmission available to deliver electricity, Glendale will be left to fend for itself. What’s the probability Glendale we’ll have N-1-1 events? And what’s the probability that they will occur when loads are at their historical peak? How long do we expect these N-1-1 events to last? The Pacific DC Intertie experiences a high frequency of outage events, which can last for significant durations. If Glendale does not carry reserves to cover its N-1-1 contingency, even though it is aware of the frequency at which it experiences a de-rate or loss of the Pacific DC Intertie –its N-1 contingency -- Glendale would spend significant periods of the year taking the risk of an N-1-1 event that it is not prepared to cover. What would Glendale pay LADWP to cover us during the hours that we are short? The comment incorrectly assumes we can pay LADWP to cover a shortage. The point is that LADWP has no obligation to cover us when we are short, except for the 80 MW that LADWP has agreed to provide under the BAASA, and only if the BAASA is not terminated. Glendale’s failure to follow Good Utility Practice and maintain reserves in accordance with its contractual commitments is not LADWP’s problem to solve. In addition, even assuming LADWP can and would provide power after the first 60 minutes, the rate for this energy is three times LADWP’s Tariff energy rate and GWP must return the energy it purchases back to LADWP at a future time. How does the cost of utilizing reserves from LADWP compare to the cost of building generation capacity? A cost-benefit comparison that is limited to comparing the cost of purchasing 80 MW of contingency reserves from LADWP to the cost of constructing Grayson is overly simplistic --- especially if that analysis is based upon the false premise that Glendale can buy all of the reserves it needs from LADWP, or that 80 MW is all the reserves that Glendale needs. Click here to view the load profile information for Glendale for the years 2015-2017. During these times GWP would not be able to meet load given that all local generation and all transmission would be fully utilized. It would also be GWP’s responsibility to ensure that there would be sufficient reserves to cover contingencies or would be forced to shed load further. Below are estimated costs of the proposed repowering options as presented to City Council on April 10, 2018. The below cost estimates are cost estimates as of April 10, 2018; costs are subject to change. PSC Primoris - ARB, Inc. The EPC RFP is scheduled to be released in August, 2017. Click here to view the whole Draft Environmental Impact Report (DEIR) for the Grayson Repowering Project. The DEIR is also broken down by sections below. The original 45 day review period was from September 18, 2017 through November 3, 2017. The City of Glendale extended the review period until November 20, 2017. Click here to view FAQs for the Grayson Repowering DEIR. Click here to view the Power Point from GWP's Special Commission Meeting on the DEIR.